A "roadshow" was a special showing of a major film. Even though this type of presentation was around since the silent era, David O. Selznick set the standard for the "roadshow" presentation in 1939 with Gone With the Wind. It was called "showmanship." Here's a normal "roadshow" presentation. Upon entering, the audience was to see nothing but a huge curtain and listen to parlor music, called an overture. The curtain was to open to the studio logo, no trailers. The film was to be shown in a larger format such as 65mm or 70mm instead of the normal 35mm. There would be an intermission where the curtain would close. The audience was never to see a blank screen. Music would start back up a few minutes before the second half would start so everyone would know to take their seats. Then, at the end of the film, the curtains would close and exit music would be played. This was to give the atmosphere of an elegant presentation. Because these were special presentations on a larger format than normal, the theaters were able to charge more than the normal admission fee. Special advertising materials were created to show that these were not the regular presentation. Roadshow advertising material quite often was more beautiful than the normal posters. The best way to identify "roadshow" material was to look for special enlarged format logos on the posters, such as Todd-AO, 65mm presentation, 70mm presentation, etc. 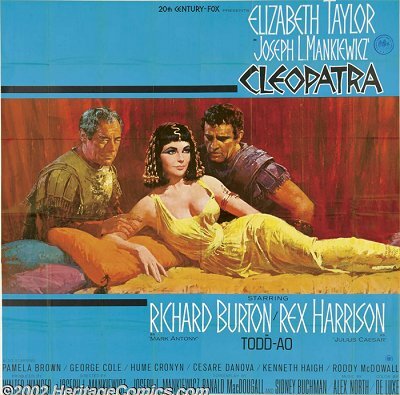 The sample below is a roadshow six sheet for the 1963 blockbuster Cleopatra. Roadshow materials were issued in all of the standard sizes. They can be either original release or re-issue, depending on the schedule of the roadshow. When original materials were used, they would include a snipe indicating "Limited Engagement," or other indication of roadshow presentation.